The Pre-Columbian Gold Museum (Museo del Oro Precolombino) | Travel Smart! The Pre-Colombian civilization in Costa Rica was really impressive and I’d like to take you for a quick tour into this amazing Museum in San José. You can click on the pictures to enlarge them (some of them). 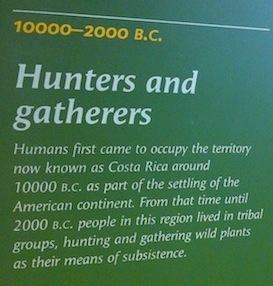 Humans are believed to be present on the Costa Rican soil since 10 000 B.C. Museo del Oro Precolombino, San José. Between the years 500 and 700, gold production was developed by local groups and formed a part of a tradition from Colombia to Costa Rica and local styles has appeared. 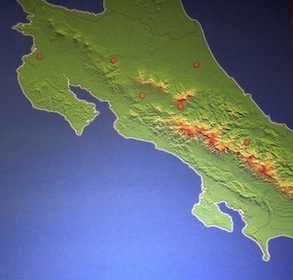 The picture shows the archeological sites with gold objects in Costa Rica between 500 and 700. Some gold pieces are very well detailed, and here are some examples. The contact with the Western World changed everything of course in the history of the indigenous civilization. 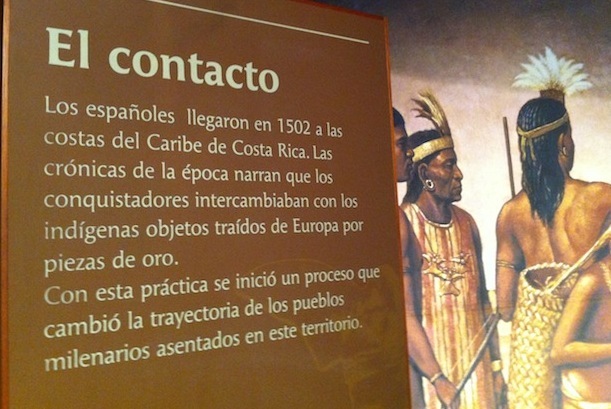 The Spanish came to the Caribbean coasts of Costa Rica in 1502. The artwork of gold started to decline since that date. At the end, I wanted to share with you this wonderful painting showing the Spanish conquerors doing commerce with the indigenous of Costa Rica on the Caribbean coast. Museo del Oro Precolombino – San José, Costa Rica.